I proved yesterday that I can walk five miles uphill with 40 pounds of camping gear strapped on. Actually, I sorta knew I could because I’d done it with a bit less weight last month, but I hadn’t done it at Henry Coe State Park, which has some of the steepest trails in the Bay Area. Miles just seem longer at Henry Coe — the downhills make you wish you were going up, the uphills make you wish you were going down. And since the park is situated on a series of mountainous ridges, difficult patches of trail outnumber easy ones by a ratio of about 30 to 1. Last time I camped out by myself, got lonesome, and figured this time I’d find some people to go with me. 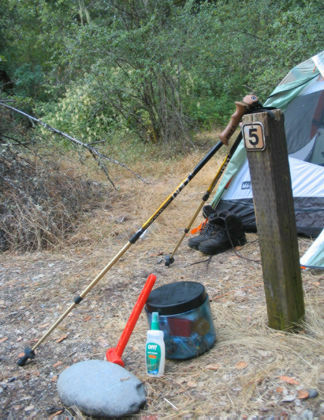 So I went to Craig’s List, put "backpacking" in its search engine and happened across the East Bay Backpacking Club, which a couple women were getting organized. The group was so new that it had never actually gone backpacking yet, but the folks I talked to via e-mail sounded like they had tons of trail experience under their feet so I figured what the heck, if they’ve done it three times, they’re more experienced than I am. 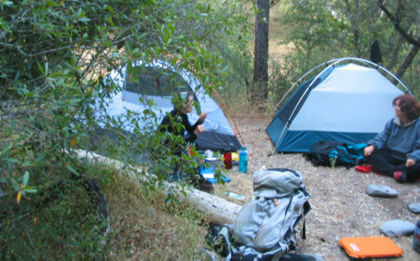 Last week I sent a message to the group asking if anybody wanted to do an overnighter at Henry Coe. Two people volunteered — Teresa, the founder of the group, and Lourdes, one of the first to join up. I’m all "hey, the more the merrier" before giving much thought to what it looks like, old married guy me camping in the woods with two women who are not a sister, nun, cousin, or otherwise out of bounds. I picture myself a paragon of openness between guys & gals, but in the trenches I’m a prisoner of social convention, because this feels weird and foreign, like something guys like me just shouldn’t be doing. Thus, my dilemma: going into the woods alone, risking falling down a hillside and the wild boars finding me before the park rangers do, or getting outside my comfort zone and going backpacking with two people who know what they’re doing but happen to be female. I was determined to go (but avoid becoming pig food), so I figured the latter would be wiser. That judgment turned out correct: I met Teresa and Lourdes at a BART stop, drove to the park, hiked six miles to the campsite on Saturday, hiked five miles back to the parking lot Sunday, dropped ’em off at the BART — no big deal. They slept in their tents, I slept in mine, everybody got along fine. Nobody broke any legs and no wild pigs were seen. I still feel a little iffy about it, but I’m sure there’ll be some guys along at the next club outing so we can talk about sports and cars, and belch loudly when no women are nearby. I’d have much preferred to take Melissa along (hey, she’s a much better cook! ), but her feet and knees don’t do tough terrain, so everybody has to adapt a bit. OK, enough gender angst, let’s look at the pictures. Lourdes, in front, is the strongest hiker of the three. She goes up and down hills with this huge pack and barely breaks a sweat. I spent most of the hike in the middle, with Teresa trailing. Teresa has this Zen-like ability to judge how much energy she’ll need for the entire hike, and to take it slow and easy the whole way and ensure she’s not burned out at the end. 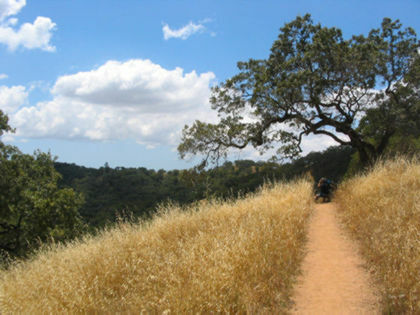 The weather’s fine at Henry Coe — normally it’s already in the upper 90s by this time of year, which makes hiking here a nightmare, but we had one last burst of cool weather last week and it lasted all weekend. Scenery’s not bad, either. 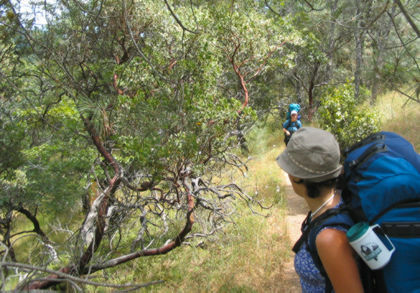 If you ever go backpacking at Henry Coe, it’s best to ask the rangers about the terrain and availability of water and campsites. We were hoping to camp at a cool little site called China Hole, but other campers had gotten there first. 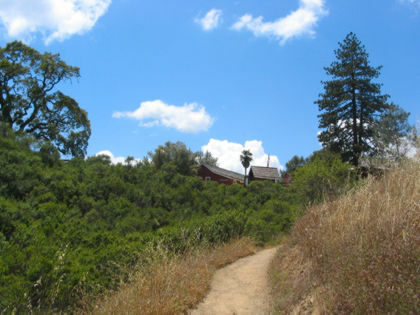 The second choice was an area called Poverty Flat, which is about a half-mile up the Coyote Creek. Scenery isn’t quite as spectacular, but there is an outhouse for campers (otherwise you have to poop in the woods and bury the remains, ick). The park headquarters is at about 2500 feet, and Poverty Flat is at about 1100. The question on our minds is how best to descend that 1400 feet. 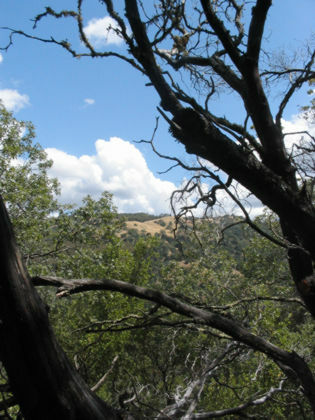 We could take the Poverty Flat Road, which is steep, dusty and less interesting, but the ranger suggests taking the Fish Trail to the Middle Ridge Trail, which takes us down to a fork of the Coyote Creek. It’s a beautiful hike, shady almost all the way. Still pretty steep, because it’s Henry Coe and all the trails are steep, but not too terribly difficult. Six miles vs. four, but better scenery and an easier descent. 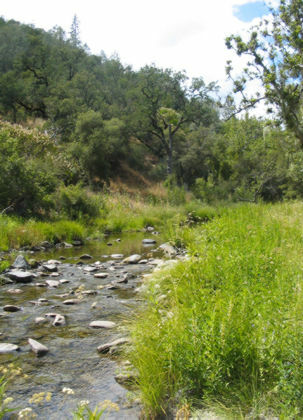 Here’s the Coyote Creek fork, which we had to cross three times before we got to our campsite. Found out again that boots are waterproof only up to the point where the water pours in. Lourdes and Teresa at the campsite, which was a bit small for three tents. 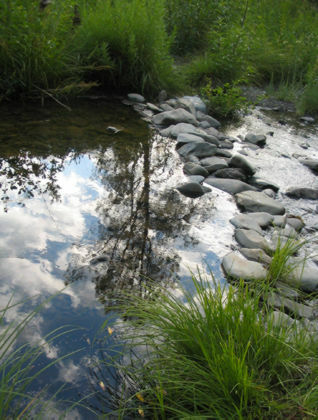 We were about 20 feet from the creek, so the sound of water running was our constant companion. Some of my stuff: Note the wet boots in the background. My new anti-bear canister has about three days worth of food in it. Melissa cooked up some veggie pasta for me and froze it in chunks that fit right into my new stove pot. The stove burns like the blazes — had to teach myself to turn the flame way down to avoid burning my chow, which was tasty as all get-out. Note to married guys: if you can’t take your wife along, count yourself lucky if you can take her cooking along. As night falls, the crickets and frogs raise a racket like you wouldn’t believe. Fortunately, I’m tired enough to sleep through Armageddon. I wake up in the middle of the night, though, and they’ve all gone to sleep. There’s no wind and it’s quiet as a tomb out there. Then I hear an owl hoot-hooting, and a second one hoot-hooting in return. You go through all this sweat and strain to be awake at that moment, when you’re the only human who can hear those owls making chitchat in the treetops. Sunday morning., I’m up at dawn because I can’t sleep a wink when there’s sunlight in my tent. I go scouting for the entrance to our return trail. It requires yet another creek crossing, which we all had enough of on Saturday. And it requires climbing 1300 feet in eight-tenths of a mile, the perfect way to ruin the effects of a good night’s sleep. I make an executive decision: we’ll go up the "easy" way, which covers that elevation in in about a mile and a half. 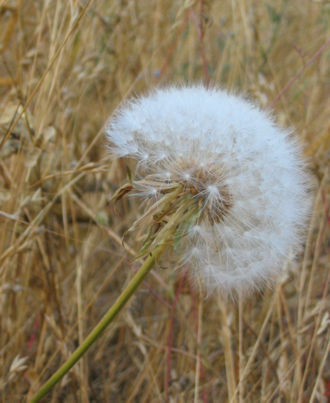 After taking 19 zillion pictures of pretty wildflowers, I thought a good ol’ dandelion deserved a shot. 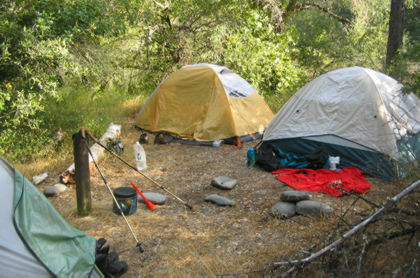 Back at the campsite, my fellow campers haven’t emerged from their nylon cocoons. But the sound of me stumbling around will wake ’em up soon enough. 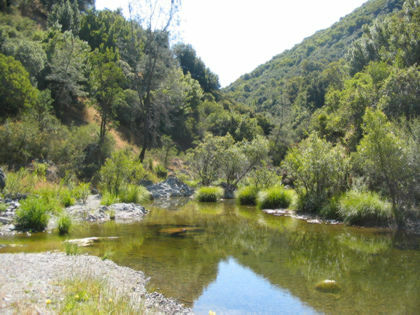 Around 10 a.m. we break camp and head down the Creekside Trail to China Hole, which is at the confluence of two forks of the Coyote Creek. There’s water here all year, which is good to know in the summer, when Henry Coe dries up like a sponge that’s been left out in sun too long. With scenery like this, the single China Hole campsite is always in demand on weekends when the weather’s pleasant. The water’s deep enough for swimming in a few places, but you have to get across the water to the campsite. Also: no outhouse. So if you come to the park thinking China Hole is your place to go, Poverty Flat is an excellent alternative (but there are many more — it’s a huge park). 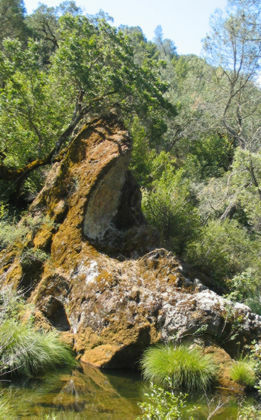 An excellent rock at China Hole. Looks like the mouth of a rattlesnake getting ready to strike. Along the China Hole Trail — you can judge how high you are by the nearby ridges. As long as the ridges are still way up there, you’ve got a ways to go. Teresa loved this sign: only 26 miles back to Coe Headquarters, if you leave out the decimal point. The grass has all turned golden now — creating an interesting visual contrast between the ground and the sky. This year is the first time I’ve actually walked over the hills as they are changing color. It’s an amazing transformation, much better to see close-up. The green hills of spring are OK, but I prefer the color of summer. This is why they call California the Golden State. Coe Headquarters, just ahead. Or should I say just uphill. Because on this route, it’s all uphill. I know that because my legs are still reminding me this morning. When you’re backpacking, social convention is just one more thing weighing on your shoulders. Anything can happen in the wilderness, and the bad things can kill you. Lots of people go backpacking solo, but it’s folly for a rookie. If you’ve got folks who are willing to come along for the hike (and, heaven forbid, go for help if something goes wrong), just bring ’em along. I love reading your trip reports!!! Thanks. I too love Henry Coe park. It is amazing. You should enter via the Hunting Hollow/Coyote Creek entrances. You will be much closer to all of the amazing lakes. Way to go, most people visit Coe one time only. The return to headquarters is epic uphill, into the sun and into the wind while your way tired. Hunting Hollow is more humane to the new visitors who want more than a 2 mile hike or bike. Mississippi is the bomb. We caught big bass on naked hooks! 36 mile round trip from Hot Springs entrance. Coe park is by far the most awesome place. Mississippi Lake is the best spot. 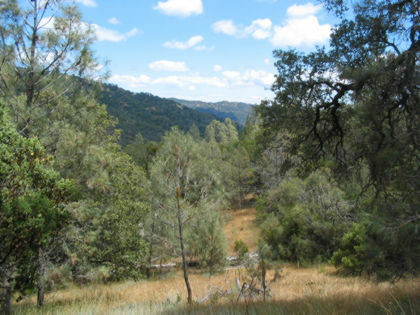 Try the Orestimba wilderness sometime. The place is amazing but brutal. Coe in the summer again? You’re a bigger masochist than I.